I love writing. I love journaling. And when I get around to it, I love blogging :-) This book provides writing cues to "practice happiness so it gets easier to find" (Kempster, Leder viii). Still in the thick of nursing a newborn, finishing my first year of homeschooling, and potty-training my son, I am hormonal, impatient, discouraged, and whipped. I NEED to exercise my happy thoughts! When the baby is wailing in the car, and I've been driving lost for 30 minutes with two other hungry kids in the van, I have chanted the mantra, "Happy, happy, happy, happy, HAPPY!" as I white-knuckle the steering wheel. Yes, I have questioned my sanity in those moments. Then I step out into the sunshine at our intended destination and exhale. I made it- frazzled but with brain still in tact. It doesn't seem such an easy thing to make yourself happy in the middle of shoulder stress up to your ears. Maybe it takes just a smidgeon of effort. But effort towards happiness has got to be fun, right? This books gives me permission to let myself BE happy. Finding joy in the silly things that make me happy, like the color red, or glitter, or the saying the name, "Penelope." I need to paint polka dots on our fingernails NOW, Bella! Pronto! 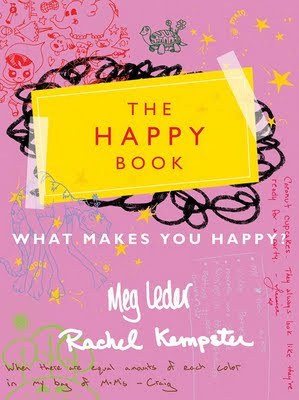 Try this happy exercise: log every single thing that makes you happy throughout the day (i.e. stealing a nap, guzzling an ice cold glass of water, finishing a project, meeting someone for lunch, wearing your favorite shirt, finding a dollar in your coat pocket...). My return to blogging turns up the corners of my mouth and soul too.